Marion doesn’t remember a more thrifty manufacturing enterprise than that of Oborn Bros., manufacturers of the Oborn Hay Tools. The business of this town has become national and international in its scope with so little fuss, that Marionites have hardly thought about it. 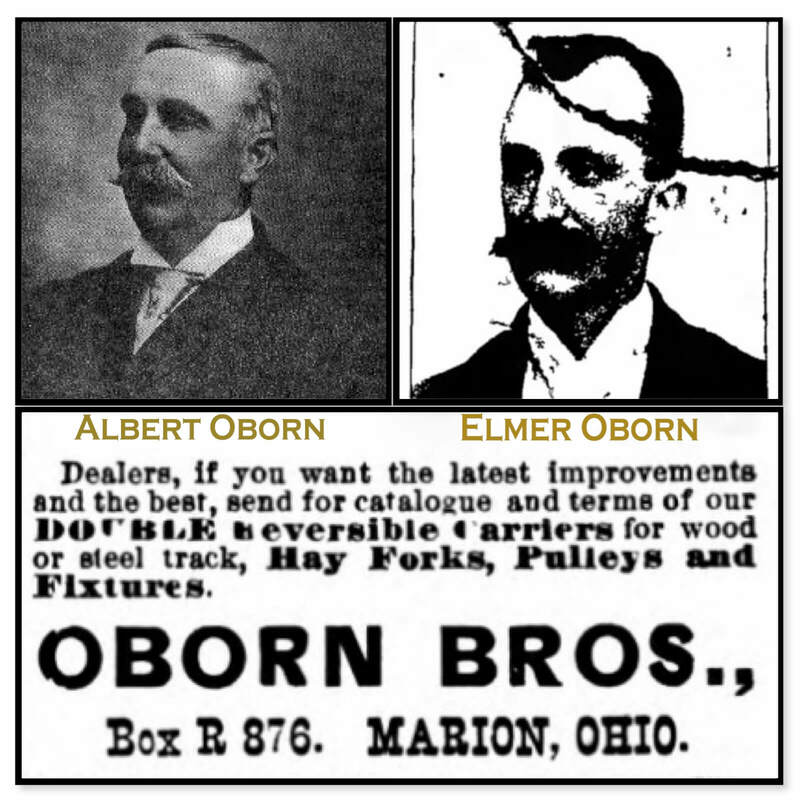 The firm of Oborn Bros consists of Albert and Elmer Oborn. Originally the firm contained Benjamin Oborn, who patented the first hay carrier in 1882 and organized the partnership with his brothers foundry on the manufacture and wholesale trade. The death of Mr. Benjamin Oborn in 1890 left his brothers to continue the business. Oborn Bros. manufacture a very complete line of haying tools and handle the necessary equipments for their operation. Chief among their catalogued products are the following: The Oborn Improved Reversible Hay Carrier, undoubtedly the best working hay carrier manufactured. Its perfect lock is the secret of its marked superiority. 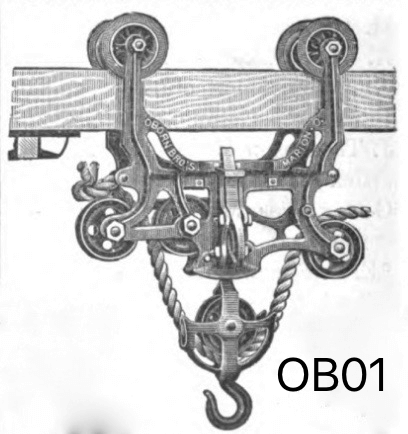 The Monarch Combination Carrier, constructed with patent double pulley. The Monarch Reversible Carrier. The Eclipse Carrier and such other hay tools as the Center Trip Hay Sling, a device that will unload a wagon of hay in two or three lifts and is superior to all other unloaders on the market, hay stackers, rod or cable track carriers, pulleys, forks, ropes, etc. The Oborn hay tools embrace the very latest and most approved improvements are carefully made and tested, have a finish second to none so they occupy the very front rank in their line. The firm made a modest beginning, but enterprise and determination to win on merit have enabled Oborn Bros to enlist the good will of pleased patrons all over the land. Both partners are young practical men, with experience in the actual needs of hay harvest to guide them in perfecting tools, so it is little wonder they succeed. Benjamin Oborn’s Obituary Marion Daily Star, (Marion, Ohio) July 27, 1891: Saturday’s Star contained the sad news, without particulars, of the death of Benjamin Oborn, the chief draughtsman of the Steam Shovel Co. and there is not a great deal to add to the pathetic announcement. Mr. Oborn, with his wife, to whom he was married about three years ago, accompanied the excursion to Silver Lake in the morning, in his usual health and buoyant with the prospect of a pleasant day’s outing with his shopmates. A base ball outfit and footballs were taken along by the boys, intending to enjoy the day. About 1 o’clock Mr. Oborn joined in the game of football with the office force, entering into the sport with a great deal of zeal. He had played probably ten or fifteen minutes, when he remarked to an associate that he was feeling very warm. He had scarcely made the remark when the ball came flying his way; he picked it up, kicked it back and fell over, dying within a few minutes. As soon as the man’s condition was realized the men crowded around and for an hour rubbed the prostate form with spirits, hoping thereby to bring back some evidence of life but of no avail; the form that but a short time before was so full of life and zeal in the enjoyment of the sport was stilled in death. The circumstances threw a pall over the entire party and the day’s enjoyment was sadly ended. Anxiety was turned from the dead man to his afflicted wife, whose suffering cannot be imagined. There was no more picnic, and the happy party that had gone out with a single thought of a day of recreation returned saddened with the occurrence of their associate’s death. The remains were taken from Silver Lake to Bellefontaine, a few miles distant, prepared for burial and brought on to this city. The late home of the deceased, on west South street, was the scene all day Sunday of a constant throng of sympathetic visitors. Deceased was 31 years of age, born in Richland township, and went to work for the Steam Shovel Co. about three years ago. He was a valuable man and his loss is a severe one to the company. ALBERT OBORN, a representative and influential farmer of Richland township, residing upon a fine farm of 178 acres located in section 18, was born December 31, 1858, on the farm where he now resides. He is a son of William and Mary Jane (Emery) Oborn and a grandson of Joseph and Mary (Smith) Oborn. Joseph Oborn and his wife who were born in Pennsylvania, were respectively, of Scotch and Irish descent. Upon coming to Ohio, they first settled in Perry County, removing later, in 1835, to Richland township, Marion County, where Joseph Oborn entered land — the farm that our subject now owns. After a short residence here, they returned to Perry County for one year, and then came back to Marlon County, making the trip in wagons, often finding it necessary to cut their way through the timber. Joseph Oborn erected a log house, began clearing the land, and with his wife battled with all kinds of hardships to make a living and raise their family. Upon the discovery of gold in California, he joined the fortune-seekers in their journey to the far West. His search for the precious metal not proving successful, he started home in the summer by way of the Isthmus of Panama. He was taken sick while crossing the isthmus, died on the 6th of August, 1850, aged 59 years and 6 months and buried there. By those who remember him, Joseph Oborn is said to have been a good scholar, with an extensive knowledge of surveying and trigonometry by which he could figure eclipses of the sun and moon. He excelled in writing and penmanship. For many years he was school examiner in Richland township: before he would issue a certificate to teacher, the applicant had to satisfy him that he could make a pen out of a quill and write a good, legible hand. His wife Mary survived him many years, dying April 7, 1880, aged 91 years and one month, and being buried in the Marion Cemetery. William Oborn was born in Perry County, Ohio, and was the eldest of a family of three children in the parental family, the others being Joseph, and Jane, who married Benjamin Waddel. William accompanied his parents to Marion County in childhood and thereafter lived on the homestead in Richland township, which he helped to clear and put under cultivation, enduring, many hardships in the first years of his residence here. He married Mary Jane Emery and to them nine children were born, namely Albert; Benjamin, deceased; Elmer; Mary Jane, who married Samuel Beringer; Ida C., who married Wesley King; John; Ella, who marriedAmbrose Myers; Roscoe; and William. The father of our subject died on the home place November 10, 1883; our subject's mother, died January 27, 1898. Albert Oborn was reared and has always lived on his present farm, having bought the land from his father's estate. The farm, which is situated on the banks of the Whetstone River, is called "River View Farm" and is one of the best improved and most highly cultivated properties in its section of the county. ,The house which Mr. Oborn and his family occupy was erected by his father. Mr. Oborn was married October 19, 1889 to Cora Reber, a daughter of Felix and Harriet (Brobst) Reber. Felix Reber, who was born, reared and educated in Fairfield County, Ohio, was connected with the well-known Reber and Peters families of Pickaway and Fairfield counties, Ohio. Felix Reber came to Marion County in 1871 and bought and located on a farm of 320 acres, the greater of which is still owned by his son Frank. Mr. Reber died March 11, 1887, and his widow died November 10,1905, aged 73 years. Seven children were born to Mr. and Mrs. Reber;Samuel; Sarah, who married George W. King; Ida, who married James Hill; Frank; Eugene, who died September 15, 1897; Cora, the wife of our subject; and Nellie (Holverstott). Mr. and Mrs. Oborn are the parents of three children: Harold R., Eugene W. and Gertrude. Mr. Oborn is a Republican and ran for county commissioner when the county was Democratic by a majority of over 900, and came wi thin about 100 votes of being elected, which gives evidence of his popularity and good standing among his friends and fellow citizens. He was a director of the Marion County Agricultural Society for six years and president of the Fair Board two years. He is at present President of the School Board, of which he has been a member for a number of years. He is Secretary and Treasurer of the Marion County Mutual Fire Insurance Company. He is a member of the Methodist Episcopal Church and has served as class leader and at different times as superintendent of the Sunday-school since the death of his father, who held that office for many years prior to his death. Mr. Oborn's portrait accompanies this sketch. Source: J. Wilbur Jacoby. 1907. History of Marion County, Ohio, and Representative Citizens. Biographical Publ. Co., Chicago, IL (Broderbund CD-450; also online at Heritage Pursuit).